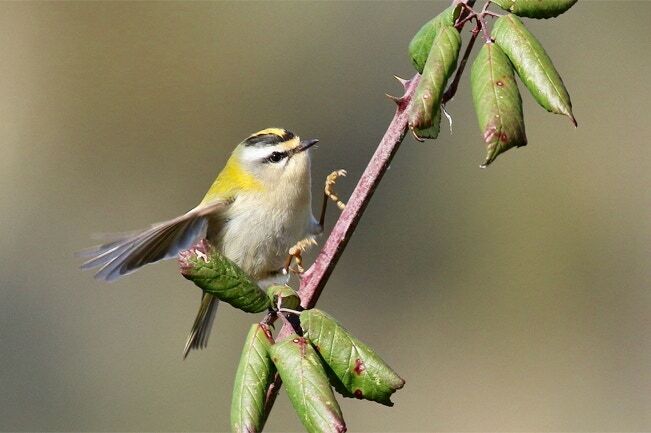 The Firecrest is an incredibly rare bird with only around 550 known pairs in the uk. They are migratory. an orange/yellow stripe on the centre of its head compared to yellow on a goldcrest.It also has a semi circular black stripe which becomes an orange collar. 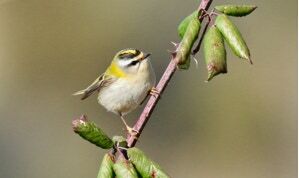 You will find this tiny passerine among holly or beech. I have a photo of a similar goldcrest in flight taking insects out of the air.They do not eat bird seeds. They are not native to the uk. They are approximately 9cm in length and have a wingspan of 13 to 16cm. They weigh in at an incredible 5 to 7g.